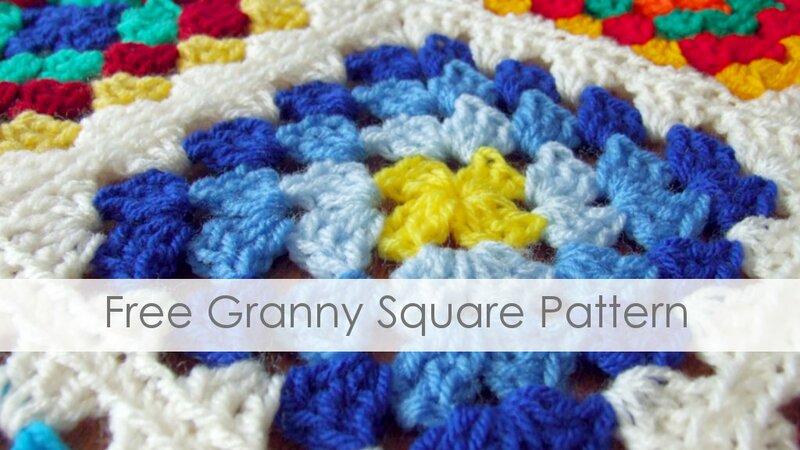 Free granny square pattern - crochet a granny square! Here is my free granny square pattern. Now, I know there are plenty of free granny square patterns on the internet but I thought I’d add my pattern to their number. I use this pattern for all my crochet granny blankets and wanted to share it with you all. I always work the first dc as (sc, ch2) rather than ch3. I find it looks fuller and neater than the ch3. The beauty of the granny square is you can work it in any yarn weight. I usually use worsted or light worsted yarn (aran or DK for UK folks) and a H size (5mm) crochet hook. The instructions below are for the first three rounds. Repeat the instructions for round 3 on further rounds – you can keep on going until your square is massive! The pattern is in US terminology. With Color A, ch4 and join to form a ring. ch 1, sc, ch 2 (counts as 1dc), 2 dc, ch 2, [3 dc, ch 2] three times. Join in 2nd ch of first dc. End Color A. Join Color B in any ch2sp, ch 1, sc, ch 2 (counts as 1dc), 2 dc, ch 2, 3 dc, ch 1 all in same ch2sp. [ In next ch2sp work 3 dc, ch 2, 3 dc, ch 1.] Rep [ to ] in each ch2sp. Join to first dc of round. End Color B. Join Color C in a corner ch2sp, ch 1, sc, ch 2 (counts as 1 dc), 2 dc, ch 2, 3 dc all in same ch2sp. [ In each ch1sp work (3 dc, ch 1). In each ch2sp work (3 dc, ch 2, 3 dc, ch 1)]. Rep [ to ] around. Join to first dc of round. End Color C.
Repeat Round 3 for as many rounds as you want. 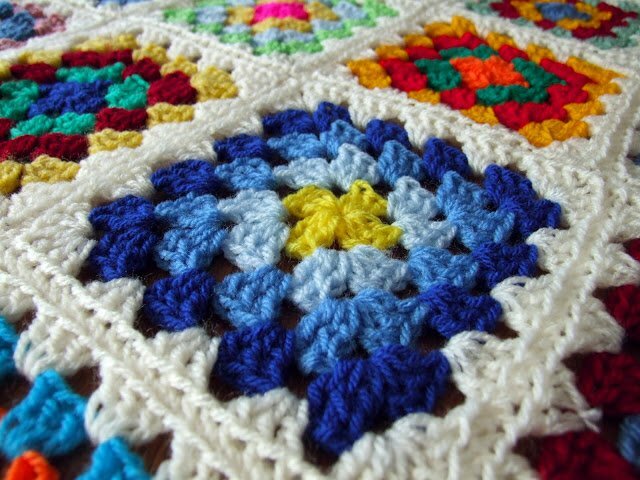 Hope you enjoy crocheting my free granny square pattern! This is so pretty. Which method are you using to join the squares? I’ve joined the squares by holding the squares so the right sides are facing, then worked slip stitches through the back loops. I’m going to do a tutorial soon so keep checking back to my website! Your color combinations are beautiful. You really have a talent for matching your colors. Thank you for posting this pattern.